Orange County Office Of Emergency Management Press Briefing Sept. 9, 12 p.m.
Orange County’s Office of Emergency Management is advising residents to stay vigilant and informed as Hurricane Irma approaches the state of Florida. Orange County Mayor Teresa Jacobs and Gov. Rick Scott held briefings at Orange County’s Emergency Operations Center at 11 a.m. and noon. As of 7 a.m., Orange County has activated to a Level 1, which includes bringing in additional support personnel for preparedness efforts at the Emergency Operations Center. Activation levels may adjust as the storm approaches. Based on the most recent update, the Office of Emergency Management anticipates that on Sunday morning Irma will reach southwest Florida and begin a northwest turn. The turn will determine the threat to Orange County. A curfew for Hurricane Irma has not been established in Orange County. However, Mayor Jacobs and the County Emergency Management Team continue to monitor storm activities. 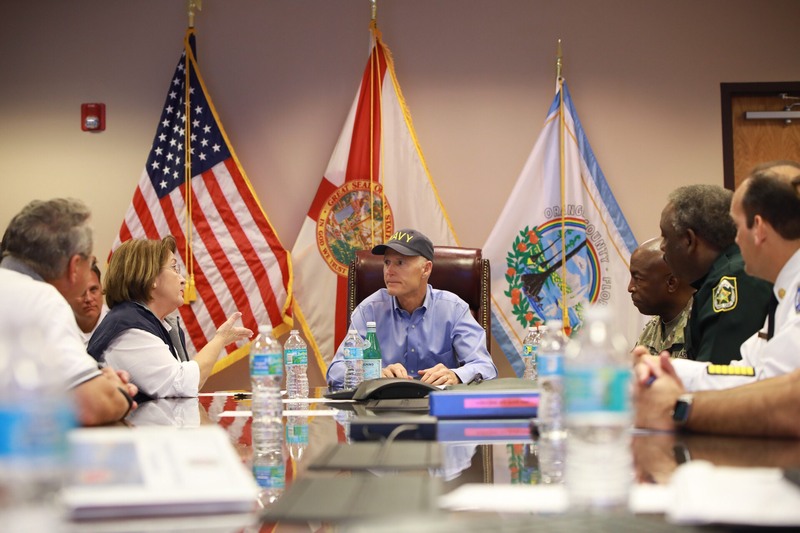 If the current hurricane trajectory remains, Mayor Jacobs will consider imposing a curfew from Sunday evening through Monday afternoon, with an exception for individuals traveling to and from work. Mayor Jacobs will receive her next briefing today at 5 p.m.
Citizens should finalize preparedness efforts to ensure that any loose items in yard or home are secured; make sure that emergency supply kits are stocked with water and non-perishable foods enough to last 3 – 5 days. Consider visiting the ATM, prior to any potential power outage. Check on neighbors, particularly seniors and those who may have special needs. Finally, please bring pets inside and ensure the safety of livestock. For official Orange County emergency information, please visit www.ocfl.net/Irma. For official information on all shelters, as well as full emergency preparedness plans, visit Orange County’s official website www.ocfl.net/storm. As of 9 a.m. this morning, Orange County opened shelters for the general population, including pet-friendly shelters. Orange County has a total of 17 shelters open. These include three (3) for Persons with Special Needs (PSN), five (5) host shelters, seven (7) general population and two (2) pet friendly shelters. There are currently 1,154 individuals at Orange County Shelters. A list of those shelters with information on what to bring to the shelters can be found at www.ocfl.net/Shelters or call 3-1-1. Orange County’s 9-1-1 call center has been reporting that people are mistakenly calling 9-1-1 instead of 3-1-1 for general information and questions. Please remember to call 3-1-1 for information – not 9-1-1. Timber Creek High School is NOT a designated shelter. Jones High School will only open as a shelter if and when Memorial Middle School reaches capacity. Remember, for shelter information, visit www.ocfl.net/irma or call 3-1-1. The Orange County Convention Center (OCCC) is not a public shelter. A curfew for Hurricane Irma has not been established in Orange County. However, Mayor Jacobs and the County Emergency Management Team continue to monitor storm activities. If the current hurricane trajectory remains, Mayor Jacobs will consider imposing a curfew from Sunday evening through Monday afternoon, with an exception for individuals traveling to and from work. Mayor Jacobs will receive her next briefing today at 5 p.m. Since Friday Sept. 8, Orange County Fire Rescue has had 25 teams going door-to door with informational fliers to the 117 mobile home parks to inform them that there is a mandatory evacuation. Fire Rescue has already contacted 1,857 homes. Orange County mobile home residents should follow the evacuation orders and be safe. Fire Rescue has also been making code red messages (reverse 9-1-1 calls). Orange County Public Works has distributed 122,692 sandbags, or 5,500 sandbags per hour. Sandbag distribution locations are not open Saturday and Sunday. Orange County’s 3-1-1 line has a language line with a translator option. Since Tuesday, our 3-1-1 call centers have taken more than 6,250 calls from citizens. A vast majority of the calls are answered within 30 seconds, and we are staffing 3-1-1 in shifts for coverage 24 hours per day. Florida Highway Patrol reminds citizens that just because there was an announcement that the storm may go west, to not go back home and to listen to officials. Hurricanes are unpredictable and safety should be your number-one priority. Residents with questions and concerns can call 311 for assistance. Finally, we will put out all information via social media and our website ocfl.net. Communication Tools: To stay informed before, during and after a storm, www.ocfl.net/apps. OCFL News provides you with breaking news about Orange County Government in action. Stay informed of important information and emergency news releases through push notifications. OCFL 311 is a smartphone app that allows users to photograph, pinpoint and report any problem you may encounter before, during or after the storm. All of this can be done directly from your smartphone to Orange County’s 311 Service Center. OC ALERT is an alert system that allows Orange County Government to contact you via email or cell phone text message during an emergency affecting Orange County. Register free-of-charge for OCAlert, http://ocalert.net.